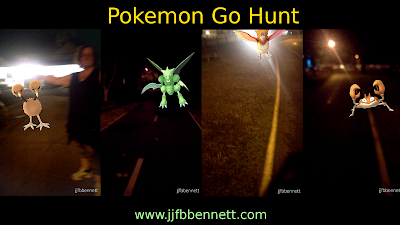 Went out Pokemon hunting with my android cell phone. In case of accident I always take some friends. Then it occurred to me this, was something I really enjoy. This urge has been around for years. I need to get out and about and discover our environment. Our children are locked within the boundaries of school. They are all locked in and hard skill assessed. Placed on a conveyor belt and sorted into hierarchical pathways. Public school stripped of all that is creative. Even the arts are disciplined. In school -where is the sense of fun and play and being part of it all. What if formal learning was stationed like Pokemon go. Where youth could congregated and learn in multiple locations. Where learning encouraged youth to collectively gather and play. Where unstructured activity blended with formal knowledge. Where youth gained freedoms to self-govern, create rules, problem-solve and resolve social conflicts. The classroom of today will not allow for the development creativity and innovation human capital. There is a need for student learning, to shift away from our controlled classrooms regulated by 'hard' achievement assessment. Almost all youth play games in some form or another. Lets let students play games in school. And design learning activities that go beyond the school boundaries.